A bungling arsonist who accidentally set himself on fire as he torched a farm building was caught on CCTV. 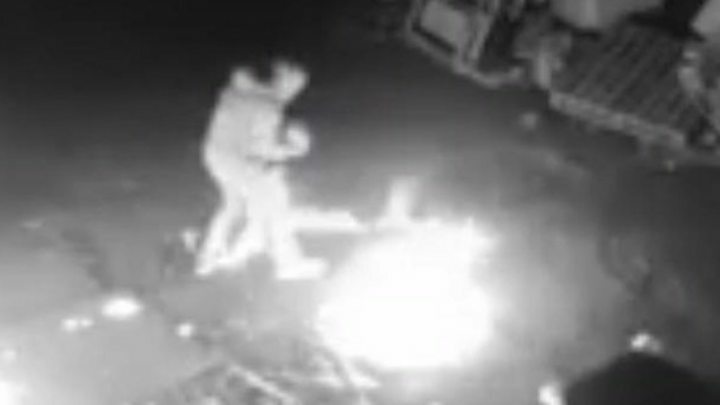 Footage of the man pouring liquid on a door of the workshop in Winlaton, Gateshead, before being caught in a fireball, has been released by police in a bid to find him. The man is seen with his arm and clothes on fire, which police believe must have caused serious burns. The blaze badly damaged the property, although no-one was reported injured. The attack happened at Riding Poultry Farm between 22:30 and 23:00 GMT on 1 March and was discovered by the owners the next morning. A Northumbria force spokeswoman said: "You can see from the footage that this is clearly a malicious arson and it has caused significant damage. "If anyone knows this man, or knows somebody who had suffered burns around the same time, we would ask you to get in touch."